Accept online payments to further streamline your administrative duties! A quick sign up process will allow you to accept Credit Card and ACH (bank account transfer) payments. No more manually logging check/cash payments for you! 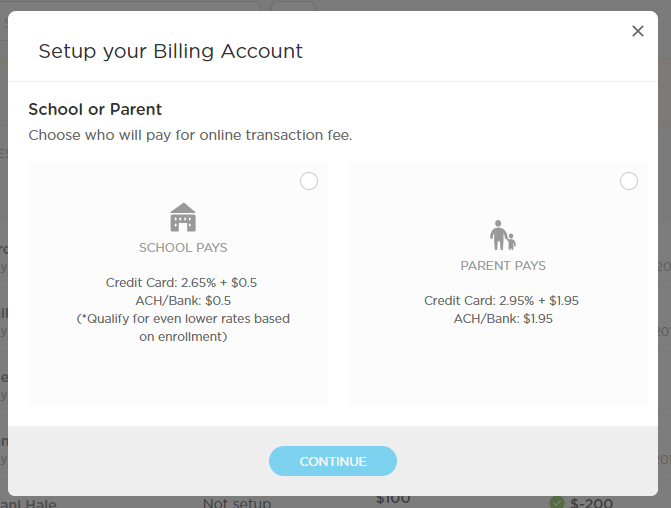 While setting up for online billing you will have the choice of assigning the transaction fees to the parents or the school. 3. Once you have made your selection you will see the transaction fees. The payout timeline is listed at the bottom of the pop up screen (this is the total time it will take payments to transfer into your account). Enter your contact information, including name, school, email and phone number. You will be contacted as soon as possible during business hours and we will walk you through the process of setting up with our payment partner, Blue Pay. We will inform you as soon as your account has been approved for collecting online payments! Now you can fully automate your billing! Checkout our Billing Webinar for details. Fill out your school details (see screenshot below) and click Continue. 2. Enter routing and bank information and click Save. Skip to Step 8. 5. If this happens, don't fret! You will reenter your information, this time including your full social security number and a scanned copy of your photo id. 6. 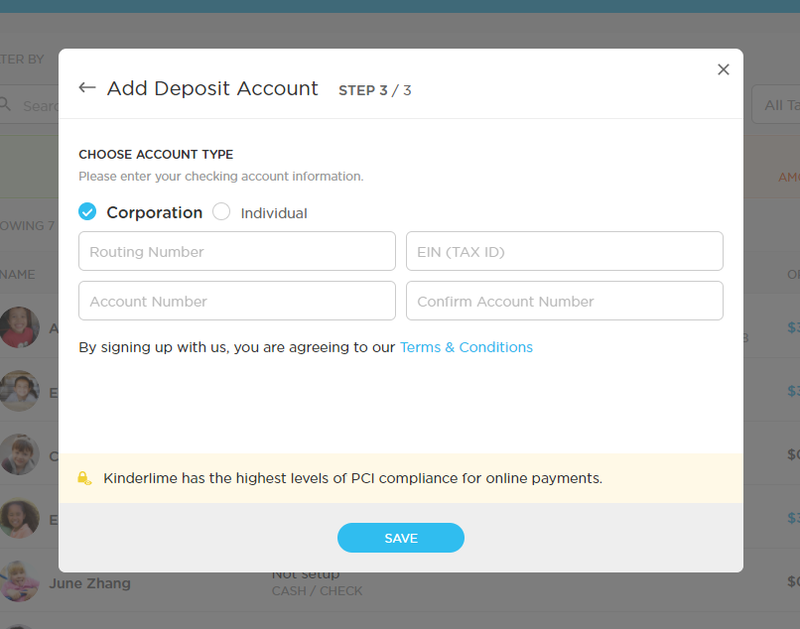 After completing verification you will see the following messaging and now you can start collecting online payments from parents immediately! 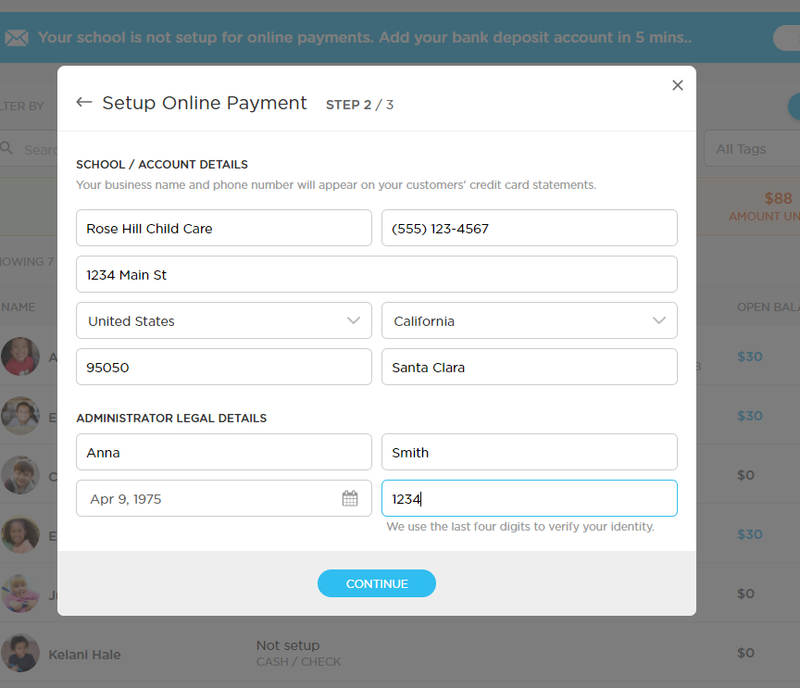 Ready to start creating invoices and billing parents? Checkout our Billing Webinar.